Pkd2 regulates osteoblast differentiation and Pkd2 overexpression rescues the defect in osteoblastogenesis in the absence of Bicc1. Transfection of two independent siRNAs targeting Pkd2 (Pkd2_1 and Pkd2_2) in primary calvarial osteoblasts reduced Pkd2 expression 48 hours after transfection (A) and alkaline phosphatase activity (B) and osteogenic gene expression (C) 4 days after transfection. 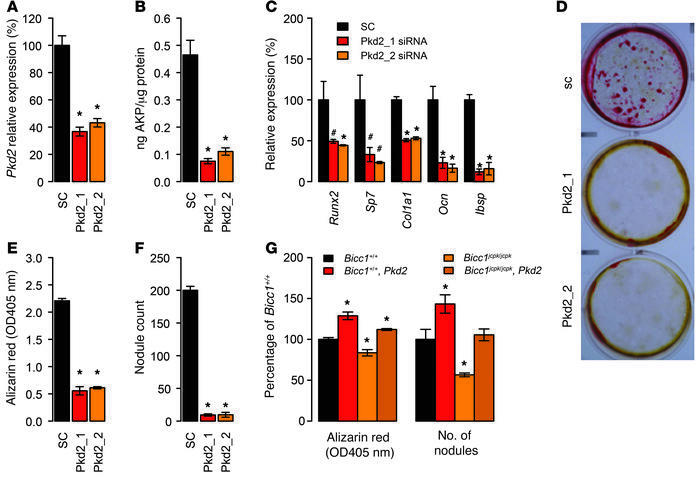 SiRNA transfection also reduced the formation of mineralized nodules (D) 12 days after transfection, as determined by Alizarin red straining (E) and nodule counts (F). Overexpression of Pkd2 increased nodule formation and rescued impaired nodule formation in Bicc1jcpk/jcpk mice (G). Data presented in all panels (except D) are the means ± SEM. #P < 0.10, *P < 0.05.